My love affair with buffalo wings began my freshman year of college. Off campus, there was a little spot called Cosmos Pizza, a popular hangout for students and townies. During my first weekend at school, a few of the girls from my floor invited me out for a bite to eat. We ended up at Cosmos, stuffed into a small booth, laughing and sharing first impressions. One of the girls ordered hot wings and promptly passed them around. Curious, I decided to give it a try. Until then, I had never had hot wings. I know, I know, how is that even possible?? Sure, I’d had fried wings and wings with Spanish rice, but that was pretty much the end of it. The moment I bit into that Cosmos wing, I couldn’t believe what I had been missing. The flavor was unbelievable, the heat just right. I had never even tasted hot sauce before! Was this what is was like?? I devoured the wing and eagerly grabbed another. There was no going back. From that point on, I never passed up the opportunity for hot wings. Luckily, I got my fix at least once a week, courtesy of the dining hall. Thursdays were wing night at Brockway Dining Hall, with enough chicken wings to feed an army. My girlfriends always knew to call my room on Thursday evenings, just in case I had fallen asleep after class. Heaven forbid I should miss out on my wings! More than a decade later, I still love hot wings. There’s nothing like that first bite into crispy skin, the taste of the sauce on your tongue, the heat that starts to creep up on you, licking your fingers after devouring each wing. 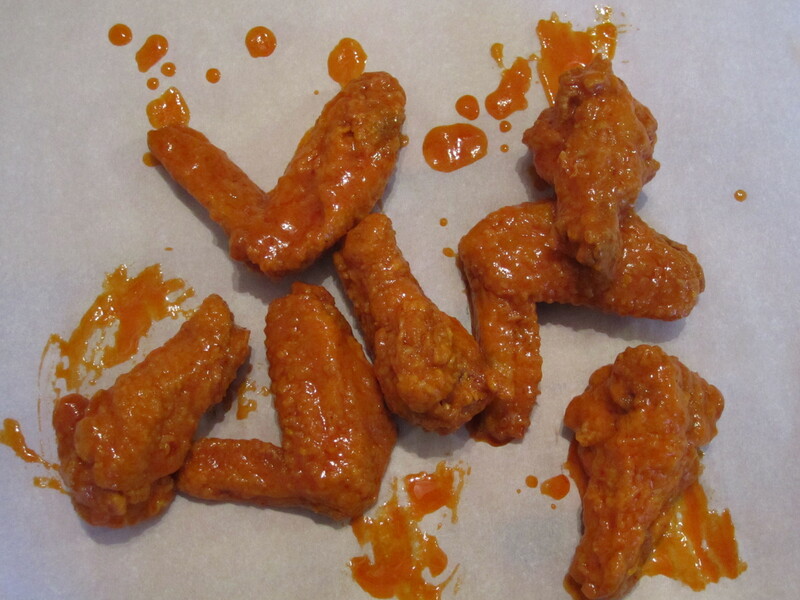 The sign of a successful wing fest are the sniffles you get from the cayenne sauce. Yeaaah. Make sure to keep a cold glass of milk nearby. It helps put out the fire party in your mouth. No wing joint nearby? Make your own! They’re super easy. Using a deep fryer or large pot, heat oil to 350 degrees. Fry the wings until golden and crispy, about 8 to 10 minutes. Place wings on a wire rack over a sheet tray lined with paper towels. In a small saucepan, melt the butter over medium heat. Add the hot sauce and stir until well combined and heated through. Pour the sauce into a large bowl, then add the wings. Toss until well combined and the wings are completely coated. Serve with blue cheese sauce for dipping. Enjoy! This entry was posted in Appetizers, Cheap Eats, Chicken, Super Bowl and tagged Buffalo Wings, Cheap Eats, Chicken, Chicken Wings, Frank's Red Hot, Game Day, Hot Wings, Super Bowl. Bookmark the permalink.